I’ve been hard on Bill Davis over the past couple of days, and while he did not have a good game, the fact is that several players the Eagles rely on to play well did not. Therefore, I figured I’d highlight a bad defensive play that was purely the result of players not doing their jobs; the Ryan Matthews 20 yard run. Situation: Game tied at 3. 4:49 remaining in the 1st quarter. SD has 2nd and 8 at its own 9 yard line. This is important to note. SD began the possession with terrible field position (penalty on kick return after an Eagles field goal) and was still able to score a TD. This play played a large role in the success of the drive. I’ve illustrated the movement of the O-Line as well as the rush angles for the D-line. Note Patrick Chung is in the box on the left, and rushes on this play. Also, the blue lines are the resulting running lanes Matthews has after the play develops. Above is the play just before Matthews gets the handoff. Notice his running lanes. Kendricks as one blocked, Ryans as another blocked. However, nobody has sealed the left edge, which Matthews sees and capitalizes on. Next, the handoff has been made and Matthews has chosen his lane (cutting back away from the direction of the line’s blocking). 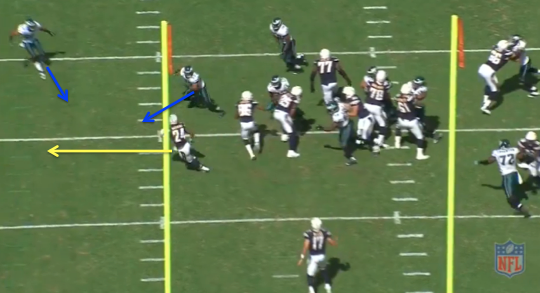 At this point, Kendricks is the only Eagle (on screen) in position to make the play. Cary Williams, of screen, has noticed the run and come out of coverage (this view is more instructive than the All-22, though it keeps Williams off-frame until next shot). 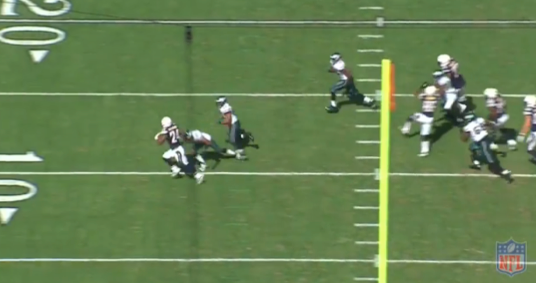 Below, we see Williams attacking and Kendricks pursuing. This is the most important frame in the breakdown. At this point, the Eagles have the play well-contained. The LOS is the 9 yard line, so if the tackle is made, the resulting gain will likely be just 3-4 yards. Look at the angles I highlighted above. Put simply, they’re not good. If Williams cuts off the sideline, Matthews has nowhere to go. Instead, he pursues aggressively (not necessarily a bad decision). Above, we see the result of the angles I highlighted in the last frame. Kendricks is beat, though it’s not really his fault. Both he and Matthews are running laterally towards the side-line, and I don’t think expecting Kendricks to match Matthews’ speed is fair. The bigger issue here is Cary Williams. His poor previous angle means the sideline is now open for Matthews; all he has to do is beat Williams to the spot. Below, we see the moment of truth. Williams has put himself in position to make a tackle, but he’s also failed to contain Matthews, meaning if Williams DOESN’T make the play, nobody else can. 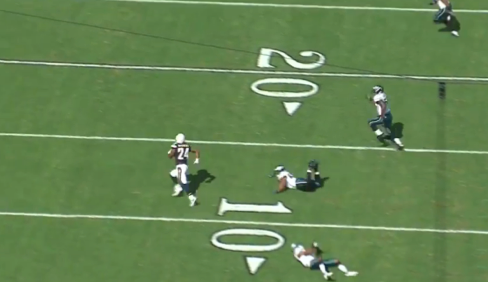 Conversely, had he contained, Kendricks would be in position to make the tackle. Williams doesn’t make the tackle. Contain is broken, so nobody else is in position to make the play. A 3-4 yard gain has turned into a 20 yard gain, moving the Chargers from 2nd and 8 at its own 9 yard line to 1st and 20 at their 29 yard line. I still don’t understand Davis’ reluctance to incorporate the 4-3 into his defense, at least until the team has the personnel to commit to the 3-4. However, if guys like Williams and Kendricks (to a lesser extent here), don’t perform, it doesn’t matter what defensive scheme the team runs, or how well blitzes are disguised. We know Nate Allen isn’t good. We know the backup CBs will be overmatched. It’s wasted energy to lament those areas. Guys like Williams and Kendricks, however, are fair game, and need to be much better. I said after the game that the biggest disappointment for me was Bill Davis, the defensive coordinator. Put simply, the defense was SO BAD at times, that a response of “let’s try anything because it can’t possible be worse than this” was warranted. I still have to go through the All-22, but at the moment, it seems like Davis wasn’t nearly as creative as he could have/should have been. As Eagles players have since confirmed, Rivers was consistently identifying the Eagles defensive alignment and pass-rushers pre-snap, then making the corresponding adjustments. I’ve repeatedly stressed that I’m not a scout, nor do I have any professional experience. The fact that I (and many spectators) quickly saw an issue should tell you how obvious it MUST have been to Davis. In that vein, I paid particular attention to the defensive snap counts from Sunday’s game. Seeing as it was competitive the entire time (as compared to game 1), I thought it would give us a really good idea of what Chip Kelly’s current roster hierarchy and player usage philosophy is. It’s likely, of course, that Davis has full control of the defense, though I haven’t confirmed that. Regardless, what I saw was, in light of the performance, unsettling. – Jeff Maehl played 5 total snaps (3 offense, 2 STs). Maehl is not a defender. However, given the Vinny Curry controversy, it’s very fair to question if 5 snaps of Jeff Maehl is worth an active roster spot. That suggests to me that either Chip is being really stubborn, or the Curry inactivity is the result of an “attitude” or “example-setting” rationale. Everyone knew going into the game that the pass-rush was going to be vital to success. Passing over Curry for Maehl (who was barely used), looked bad then and much worse now. It’s possible that Curry wouldn’t have helped at all (I think he’s being overrated by the general fan base); but he DEFINITELY would have helped more than Jeff Maehl (and several others). – Jordan Poyer played just 7 snaps, all on STs. Given what we know about the Eagles CBs and what happened during the game, it’s clear that Poyer has ZERO trust from the coaching staff. If he couldn’t get on the field in game where the Eagles lost a starting CB and were getting absolutely shredded with the pass, then when can he play? If at this point, he is solely a STs player, we again have to question the value of his roster spot. Granted, STs have been very good so far, so obviously they’re doing something right there. If this continues though, we might have to revisit the “overweighting STs” storyline. – Geathers played 14 snaps on defense, Square played 12. I haven’t yet looked at their individual performances, and I assume they were just as ineffectual as the starters. However, could they really have been any worse than the starters, who weren’t getting anything remotely resembling pressure? As the game progressed and it was clear the defense was not going to stop SD absent some good luck, wouldn’t it have made sense to rotate backups/young players into the game more frequently? They gain experience and/or make an impact on the game. The veterans get a breather and/or a message that their performance simply isn’t good enough. As I said before, what’s the downside? The veterans/starters couldn’t possibly have believed they “deserved” to keep playing. – One Caveat, though it doesn’t excuse Davis. Rivers used a lot of quick throws and three-step drops. In that case, it’s nearly impossible to pressure the QB, there simply isn’t enough time. The counter-move is to drop more players into coverage. Ideally, you’d hide players at the line, disguising them as pass-rushers, then have them drop underneath the short passing lanes in hopes of either cutting off passing lanes or forcing an interception. Pending All-22 review, I didn’t see Davis try this often enough, and when he did, there was no adequate disguise. Of course, dropping players into coverage assumes they’ll actually know to COVER…which apparantly is not an entirely reasonable assumption (see Eddie Royal’s hilariously open TD grab against an Eagles D rushing just 3 players). First, I need to let everyone know about a structural change to the weekly Rewind post. Last season, I typically posted at least 2-3 plays per game, with accompanying diagrams and breakdowns. As you all have undoubtedly noticed, now everyone is doing it. I’ve repeatedly stressed that my overall objective here is to provide analysis that ISN’T offered anywhere else, so the proliferation of All-22 Breakdowns puts me in a tough spot. Therefore, this season, I will still be doing a weekly “Rewind” column, but I will likely focus on particular aspects of the game that I think are going unreported. That will usually be accompanied by screenshots and/or illustrations when appropriate. However, I will reserve the play diagrams for only the most important situations. 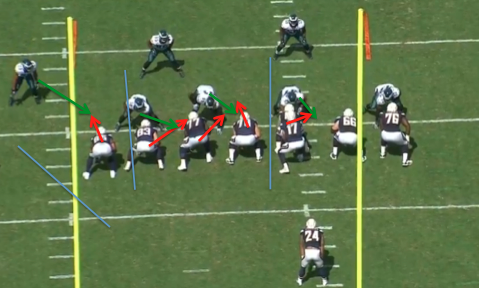 For now, if you want really good play diagrams, see Derek Sarley at Philly.com or Sheil Kapadia at Birds 24/7. If you’re at this site, you have probably already seen those breakdowns for this week, but if not, definitely take a look; it’s really high quality stuff. This play occurred on a 3rd and 11 with 4:47 remaining in the 2nd quarter. 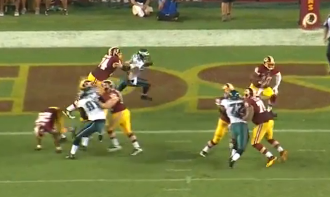 Connor Barwin rushed upfield, beat the RT outside, and chased RG3 down from behind. 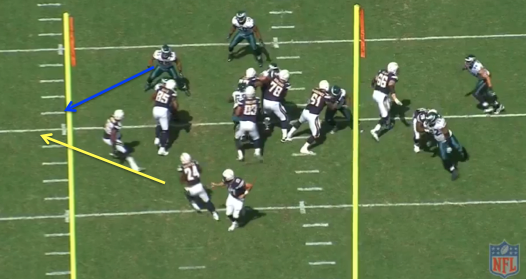 Above, you can see Griffin as he begins to leave the pocket, as well as Barwin as he turns the corner. The result of the play was a 2 yard gain. To be fair, RG3 was not running full speed. However, it’s a good example of what I saw throughout the game. Namely, RG3 played differently than he did last season (when fully healthy). Consequently, the Eagles were able to defend him differently. 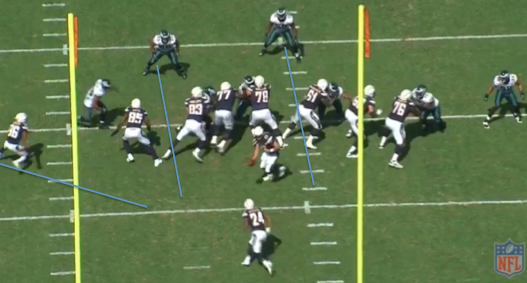 The Eagles did not have to “spy” or “mush-rush” or run any sort of QB contain scheme with the D-Line. They attacked RG3 as though he was just another “normal” QB. As we all know, what makes the Redskins dangerous is RG3. Put simply, if RG3 is playing like “just another QB”, then Washington is no longer a division favorite. As the season moves on and this game recedes into our memory, it will be tempting to say “the Eagles D handled a great offense under RG3”. That’s a mistake. Monday Night, the Eagles defense did NOT play against a great offense. So it was a good performance, but hardly indicative of what we can expect against powerful offensive teams or mobile QBs. 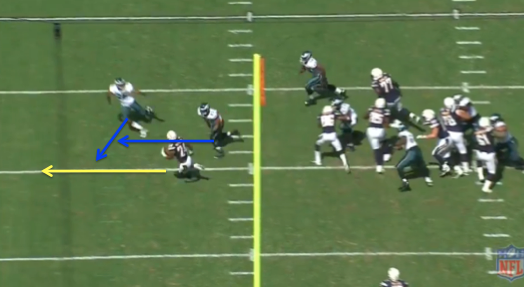 – One of my assumptions about Chip Kelly’s offense was clearly wrong. I expected the Eagles to focus more heavily on creating “matchup advantages” with their personnel groupings and formations. However, It looks as though the Eagles offensive options and read progressions will not change depending on the pre-snap defensive alignment. The Eagles will run the play called no matter what, and just force the defense to expose a weakness. There aren’t any pre-snap reads or adjustments for Vick to make (allowing the offense to move more quickly). The run fake draws the LBs, the bubble screen draws the safety, and Celek is left with an open seam, all he has to do is run straight and catch the ball. By comparison, think back to Brian Westbrook and all the moves Reid made specifically to get him the ball. Chip doesn’t appear to work that way. It’s certainly conservative, but still fairly “normal”. This is one step before RG3 makes his throw. Notice the 30 yard line, which I’ve highlighted in red. There are 5 Eagles beyond it, and NO Redskins. 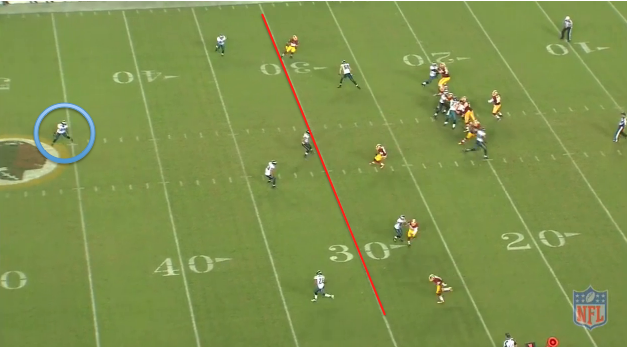 Nate Allen, deep at the start of the play, backpedals even more, despite all of the underneath routes from Washington. 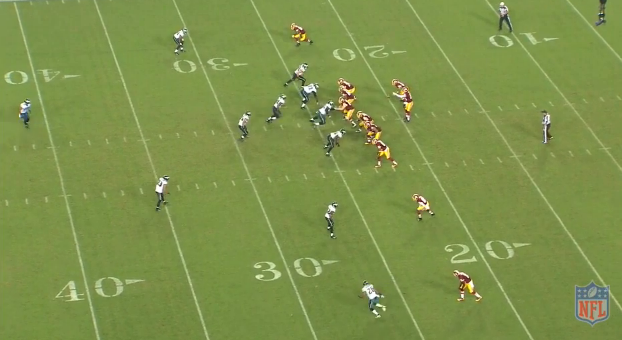 Clearly, the Eagles were content to allow short completions at this point. We can argue about the correct time to shift into this type of defense, but the point is that the 2nd half “rally” was largely a function of the score/time, and less a result of the Eagles not playing well. – I would have liked to see a bit more scheme flexibilty from Bill Davis. Given the big lead, and obvious passing situations, I hoped to see the defense shift to a 4-3, putting both Cole and Graham in a position to attack. Graham ended the game with just 16 defensive snaps. Going forward, I’ll be keeping an eye on this. In theory, if you believe the offense will score a lot of points, then the defense should be more concerned with the passing game. Here’s where Vinny Curry’s inactive/active status becomes interesting. In general, I don’t have a problem with Curry being inactive, since I assume it’s because he’s missing assignments that we can’t see. However, he is clearly on of the most disruptive pass rushers the Eagles have. With a late lead and in passing situations, being able to play a 4 man D-Line composed of Cole and Graham on the ends, and Cox and Curry in the middle, seems like a very valuable option. That’s all for now. There were some other players I was watching, but whose performance necessitates a “not enough info” or “incomplete” grade, particularly the Sopoaga/Logan situation and the Safety play. I’m sure we’ll get a better look at them next week, in what will probably be a more “normal” game. – Both QBs look really good. It looks like everyone is jumping on the Vick train, but I’m sticking with Foles. Given the performance of both QBs, this is turning into a fairly simple decision. If you want the highest upside for this season, Vick’s your guy (though he likely doesn’t offer as big an advantage as most seem to believe. On the other hand, I don’t understand how anyone can watch Nick Foles and not get at least a little excited about his potential in the NFL. Last night, Foles finally put a stake in the heart of the “too slow, not mobile” argument. I’m not even talking about the TD run. Watch him move in the pocket and avoid the rush. He consistently helps his O-Line by sliding away from pressure while keeping his eyes downfield. Most importantly, each of his throws was about as accurate as they could possibly be. Finally, I don’t mean to bring everyone down, but just remember that Michael Vick has been in the NFL for a very long time. He’s played 10 seasons and has thrown nearly 3000 passes. That sample is likely a MUCH BETTER indication of what we should expect than these past two preseason games. Maybe Chip Kelly “unlocked” Vick. It’s possible, just know that its unlikely. – Shady shouldn’t touch the field again until the regular season. I said at the end of last season that the Eagles’ rebuilding plan was relatively simple: Rely on McCoy and a healthy O-Line to carry the offense while you focus on fixing the defense. Regardless of who the QB is, its clear who will be the driver of the offense. Shady looks fantastic, lets not get him hurt. – I’ve mentioned it a few times (including yesterday), but last season the Eagles offense started their drives, on average, nearly 7 yards behind where the opposing team did. It doesn’t sound like much, but its a huge disadvantage. A big reason for that was terrible Special Teams. Perhaps the biggest preseason development is how improved the STs look. I’ve talked about how improvement was assured (by virtue of how bad the team was), but we might have to actually raise those expectations. Punt return/coverage, the biggest weakness from last year, looks really good. That should lead to a lot more points scored, regardless of whether the offense itself improves. – Some bright spots on the defense as well, though I’m grading them on a curve. Patrick Chung, if he can stay healthy, looks like he’ll be a big upgrade at Safety. The fact that he can consistently step up and make tackles is big, even if he isn’t great in coverage (haven’t seen much of this without the All-22, so I can’t grade that part of his game). – Bennie Logan and Vinny Curry are both flashing big potential. A word of caution though, they haven’t been playing against #1’s. My biggest hope for the next game is that we see a D-Line combo of Cox-Logan-Curry. Given how well Logan/Curry has played so far, Kelly owes it to them to see if they can hold up against better competition. If both players can turn into at least solid starters, the team’s defensive rebuild accelerates by at least a full season. – Might be time to forget about Trent Cole and Brandon Graham. We knew it was going to be a tall order to fit them into a 3-4/4-3 Under defense, and it looks like it’s not going to happen. At this rate, I expect to see Graham quietly traded later in the season for a middle-round draft pick. Maybe it’s too early to judge, but I’m firmly pessimistic that either one of these players can play a significant role in the new defense. At best, they’re placeholders on the depth chart until the team can draft/sign players who fit the scheme better. – Get ready to hate Cary Williams. Last night was a great example of what he “brings” to the table. He’ll be a big improvement over last year, but expect to see a high number of passes completed to his man. The book on him is he gives WRs a lot of space to make the catch underneath, but tackles them after the catch to limit gains. For this year, that’s fine, it’s a big step up from getting beat deep every other play. However, I have a feeling Eagles fans will get tired of that style fairly quickly. – I’m a little worried about Zach Ertz. In my ratings system, I had this pick as a reach. So far, he looks like a good receiver (which we expected). However, the fact that he, a high second round pick, isn’t getting more playing time tells you he must be doing something wrong in practice. Update: After finding the snap counts, it seems Ertz played more than I thought (20 snaps). I’d still like to see more of him in-line before the season starts. The easiest guess is his blocking, which was a known weakness. Still, it’s not as if the Eagles TE corps comprises a bunch of pro-bowlers. I like Celek a lot, but I’d expect the #35 overall pick to at least give him a battle for the #1 spot. Definitely not a big deal yet, but it’s something to keep an eye on. – Matt Barkley is quietly having a pretty good stretch. Granted he’s not playing against starters, but considering he was a 4th round pick, he’s acquitting himself very well. Lastly, some of you may have noticed that yesterday’s chart was also posted over at BleedingGreenNation.com. I’ve joined that site as a contributor, but this site will remain the main focus. In fact, for the time being, my BGN posts will consist entirely of what I feel are the most interesting/important EaglesRewind posts.